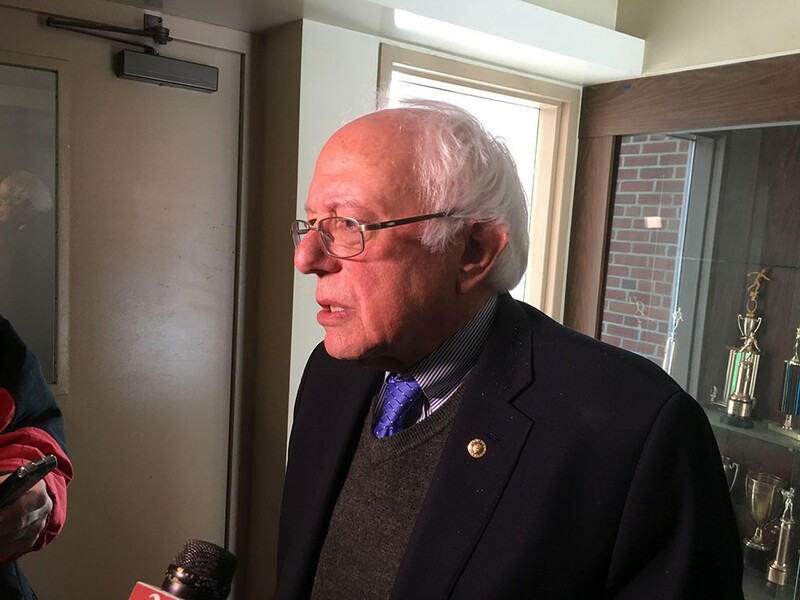 On his way out of the St. Johnsbury Academy gymnasium last Thursday, Sen. Bernie Sanders (I-Vt.) stopped in the hallway and faced the media. For all of two minutes. He answered three short questions and hustled on to his next engagement. Little did I know that this would be my one and only opportunity to ask Sanders a question. I attended five Sanders events in four Vermont towns last week without ever getting another chance. But that's just par for the course. Sanders rarely interacts with Vermont news media. He's a constant presence in national newspapers and on cable news — the very "corporate media" he rails against at every opportunity — but not in this state's media, most of it locally owned. I guess if you're looking for the biggest possible audience, well, principle be damned.It needs to be said that Sanders has accomplished historic things. He captured the imaginations (and dollars and votes) of millions of Americans. And, although he fell short of winning the Democratic presidential nomination last year, he sparked a political movement that may have a lasting impact on the nation. In the process, Sanders has become a national figure, effectively transcending his status as the junior senator from Vermont.And that's the problem. He remains the junior senator from Vermont. But he rarely acts like it. Sanders did spend two days in the Green Mountain State last week, and bully for him. He attracted loud, boisterous, adoring crowds wherever he went. He held 12 events in seven communities. But he, or his staff, chose not to make time for his home-state media. Just one event was billed as a press conference, at the Latchis Theatre in Brattleboro. Though the entire point of such an engagement is to answer questions from the press, he did not take a single one and departed before the event was over. "Bernie has a history of being quite available to us," says Dave Gram, who spent more than 31 years covering Vermont for the Associated Press before departing in January. "You went from that to almost a cold shutdown during his presidential campaign. I expected that, once the campaign was over, you'd see a reopening with the Vermont media." The last time Sanders spoke to anyone from Seven Days was April 30, 2015 — the day he announced he would seek the presidency. That's right. It's been 692 days. Since then, the state's largest newspaper has traveled to eight states to cover his presidential campaign and made dozens and dozens of interview requests, without result. The closest we came was on July 4, 2015, when Seven Days political editor Paul Heintz approached Sanders during a parade in the rural town of Creston, Iowa. The senator started to answer a question, according to Heintz, but stopped mid-sentence when he realized who was asking it — and then continued marching. We often call on our congressional delegation. Frequently we score an interview with Sen. Patrick Leahy (D-Vt.) or Congressman Peter Welch (D-Vt.). At the very least, we get a thorough response from their spokespeople. In my two and a half months in this job, I've interviewed Welch three times, Leahy twice and Sanders not at all. More often than not, I don't even get a response from the junior senator's staff. And, look, I don't care if I ever speak with Sanders — as long as he talks to somebody around here. It's not about me; it's about communicating with his constituents through the established conduit of local media. If all he does is national interviews, then when does he address questions that uniquely concern his home state? For instance, in the salad days of Jay Peak Resort development, Sanders was happy to show up for a groundbreaking and photo op. But he has never commented on the collapse of the Northeast Kingdom projects caused by the state's massive EB-5 scandal. He hasn't said boo about the proposed sale of the shuttered Vermont Yankee nuclear power plant. And he has never sufficiently addressed his consistent support for basing F-35 jets at Burlington International Airport, which many of his voters staunchly oppose. Only local media will raise those questions. If we ever get the chance. "Our access to Sen. Sanders has been zero since he entered the presidential campaign," says Mark Johnson, senior reporter and editor at the nonprofit VTDigger.org. Johnson's OK with that; what really gets his goat is the attitude of Sanders' staff. "We've had a reporter in Washington since early January," Johnson notes, referring to political writer Jasper Craven. "He has gotten literally no help or support from Sanders or his staff. It's one thing when Bernie won't speak to us, but when his staff won't respond to our reporter, it's totally outrageous." Craven can't even finagle an answer in the U.S. Capitol. "When I ask Sanders a question in a Senate hallway, he blows me off," the reporter says. "Neither of his two press people return my emails. Staffers point out that Sanders is very busy. But not only do I get no Bernie time, I haven't been able to speak to any Sanders staffer on background. I've asked for information on various Vermont issues, from the Veterans Administration to the budget cuts, and have received no help." Just as a reminder: These staffers' salaries come courtesy of taxpayers. Another nonprofit news outlet, Vermont Public Radio, has had a similar experience. "Bernie Sanders' last live appearance on VPR's 'Vermont Edition' was March 13, 2015," says Patti Daniels, the show's executive producer. "Listeners have heard taped comments ... since then, but he hasn't been live on 'Vermont Edition' to answer questions from a journalist or his constituents in two years." According to Daniels, VPR puts in a request "every four to six weeks or so." She continues: "I have asked his office to choose any day and any location that works for them, to plan as far in advance as they need to, and I've offered to cancel segments we've already booked in order to accommodate his availability." "The last interview we had with Bernie on-air was in 2013," echoes Chris Lenois, morning host on Brattleboro's WKVT Radio. "He just doesn't need us," concludes Johnson of VTDigger. "He's in a pretty unique position because he has such powerful backing in the state," Gram says. "If he decides to start talking to Vermont media more, it's going to be just maybe out of the goodness of his heart." And if you ask the average Sanders supporter, they'd probably be fine with what he's doing. They want him spreading the message nationwide. Still, he is one of only three Vermonters serving in Congress. It'd be nice, once in a while, to hear directly from him. Part of the problem, to be honest, is that Sanders seems to expect positive coverage from his home-state press. "He's never taken well to criticism," notes Gram. If I'd had the chance last week, I would have asked the same thing that's been on Gram's mind: "I think it's a legitimate question for us to ask, if we do get him: 'Hey, Senator, if you do run for reelection in 2018, are you actually going to be a senator from Vermont or are you immediately going to morph into a presidential candidate again, and we're never going to see you for another two years?'" Running for president doesn't merely keep Sanders away from Vermont. It also keeps him away from, you know, his job: U.S. senator. For a full year, Sanders missed nearly 60 percent of the Senate's roll-call votes, according to GovTrack.us. In the first half of 2016, he missed more than 90 percent. That's a greater absentee rate than for any other senator who ran for president last year. Is that acceptable? To most of his supporters, it probably is. But it would be nice to hear from Sanders directly about why he didn't show up for his day job. Despite his disappearance, media organizations still light a candle in the window every night in hopes of an encounter, however brief, with their beau ideal. Seven Days won't stop asking Sanders' office for interviews and information; neither will VTDigger or any other media outlet. VPR would desperately love to get Sanders back in rotation. "During his book tour, Sanders himself told one of our reporters that he wanted to get back into a regular appearance schedule on 'Vermont Edition,' but he hasn't made it happen," Daniels says. "Bernie," she continues, "if you're reading this, the invitation is always open — just pick a date." I want to be fair to a man who has a lot on his plate. We're not asking for the world; just a little piece would do. So here's some media-relations advice for Team Bernie. I think it's reasonable. First, make the time to hold one press conference a month specifically for Vermont media. In person if possible — by phone if not. Second, if the office staff is too damn busy to answer media inquiries, then hire somebody else. You can't offer much time with the senator, but you can respond in a timely way, provide information, point to sources and help us out with the big federal maze. Third, get back on a regular schedule with "Vermont Edition." I'd suggest four times a year. If that's too much, make it twice. "Vermont Edition" reaches all corners of the state — and offers a platform for questions from both reporters and listeners. I can hear the distant screams from other media outlets. OK, fine: twice a year on VPR and two other interview opportunities — at least 30 minutes apiece — for the rest of us. And if Seven Days doesn't make the cut, that's fine with me. Fourth, check your attitude at the door. The Vermont press corps is not your enemy. The vast majority of our coverage is positive. Indeed, the occasional negative is noticeable because it's so rare. "Man Bites Dog," don't you know. If you can't take the infrequent negative piece in stride, well, you shouldn't be in this business. I've written plenty of tough stories about Gov. Phil Scott, but his media operation remains helpful and accessible. The governor himself treats me with professionalism and grace. Is this too much to ask? I don't think so. Would it take too much time away from Sanders' national crusade? No, not really. Would it better serve his constituents? You betcha. We would've asked the senator himself what he thought of our proposal. But — wait for it — neither he nor his staff responded to our request for comment. Correction, March 22, 2017: An earlier version of this story misquoted Mark Johnson on his last conversation with Bernie Sanders. The quote has been removed. Correction, March 27, 2017: An earlier version of this story inaccurately described Sanders’ national media appearance schedule. He is no longer a weekly guest on the "Thom Hartmann Program."